The reason why I studied marketing and consumer behavior with so much interest 8 years back seems to become clear now. When education blends with your passion/purpose, it feels like magic. Over the last few days, my social media feed is flooded with updates from food bloggers on this newly launched Fortune Vivo diabetes care oil. No one cared to explain what the oil is made of, how it manages diabetes, how it regulates blood sugar etc. The copy just sounded like they were being instructed to include these key phrases - “clinically proven”, “insulin sensitivity”, “manage sugar levels”, “regulate blood sugar”. As you can see, it is a mixture of “physically refined rice bran oil (80%) and filtered sesame oil (20%)”. The pack also states “Patent applied” on its front side, to sound as though it is a revolutionary innovation. Surprised how clever marketing can be! See how we are being fooled! In South India, we have been using sesame oil (nallennai) for centuries. Since it has so many healing properties, it is not called eLLennai (sesame oil) but called nallennai (good oil). Not many people would like the strong aroma of sesame oil (I love it !! ), so the brand has nicely masked the aroma by combining it with rice bran oil. 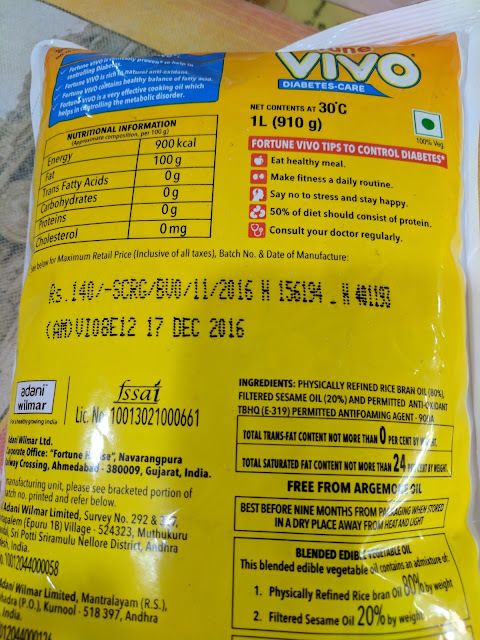 I use the same brand’s rice bran oil which costs me Rs.120 per litre, whereas this new diabetes positioned oil costs Rs.140 per litre. The brand also gives some “tips” to control diabetes. Though I agree on the first 3 points, the 4th one - “50% of diet should consist of protein”, Seriously? For once, I’m glad people don’t read anything written on the packaging. Do you want to control/prevent diabetes? Eat fresh, home-cooked meals. Stay active. Sleep well. Avoid stress. Avoid ALL packaged/ready-to-eat junk foods. You don’t need special “diabetes” branded products that are nothing but repositioned / redesigned product mix.